Dr. Jolson combines principles from extensive training in the medical profession, chiropractic, physical therapy, and sports performance to rapidly resolve sciatica symptoms without drugs or surgery. Dr. Jolson is unlike any chiropractor in Greenville SC due to his unique training. He interned with his mentor and father, Dr. Scott Jolson, MD, sports medicine and orthopedic surgery consultant to the Cincinnati Reds. Dr. Jolson also trained with Dr. Tom Lotus, spine specialist and innovative chiropractor in Chicago. Learning from the best has helped Dr. Jolson understand the full spectrum of low back pain and sciatica care – from surgery and invasive treatments to the best non-surgical options. Dr. Jolson continues to pursue a growing list of certifications, diagnostic tools, and therapy techniques. Dr. Jolson has presented on bulging discs & sciatica, injury prevention, and biomechanical seminars for local athletic teams and businesses. Dr. Jolson is the official chiropractor for PGA Tour pros and the local Hincapie Racing Team. Did you know that sciatica is not an injury or disease? That may surprise you if you have been told by a healthcare specialist that you have sciatica after complaining of pain. Instead, sciatica is a symptom described as nerve pathology or radiating pain felt due to irritation of the sciatic nerve or a component of it. The sciatic nerve officially originates at the pelvis and travels down each leg. There are five spinal cord segments (L4 through S3) that feed into the beginnings of the sciatic nerve. Your sciatic nerve is an impressively massive nerve bundle that runs either over, through, or under your piriformis muscle, depending on your individual anatomy, and ends about an inch above the knee where it branches off. Why bother getting into all of this medical and anatomical stuff? 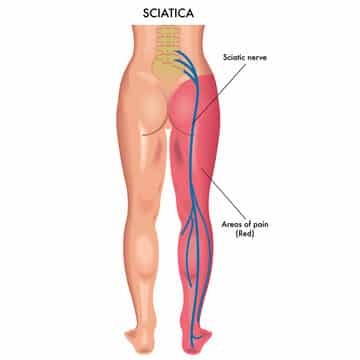 To make a point: sciatica pain is a symptom caused by many different conditions, ranging in severity from inflammation to tumors that can occur anywhere from L4 down the sciatic nerve. While we have seen and treated many causes of sciatic pain, most often the sciatic pain we see at Upstate Spine & Sport results from a bulging disc, herniated disc, or a slipped disc at the L4/L5 region. When the sciatic nerve is pinched it can cause leg pain, numbness, and pain as far down as your feet. Where you feel the pain depends on where the problem is. But sciatica pain relief is possible with the right combination of treatments for your particular cause of sciatic pain. A proper diagnosis is critical to achieving a fast recovery. In general, medical professionals define sciatica as numbness, weakness, burning, sharp, or tingling pain on one side of the body. This discomfort can be felt in the area of the lower back, buttocks, hip, leg, or foot. Pain may radiate just into the buttocks or all the way down the leg to the foot. Pain is usually worse when bending over, sitting, or with rotation through the low back and hips. Radiating pain is one of the more intense symptoms associated with sciatica that our chiropractor in Greenville treats. The patient may also feel numbness and tingling or a pins-and-needles in the low back or all the way down your leg. The symptoms aren’t always consistent – the pain may be variable and jump around in different locations. All of these symptoms can range from very mild to severely debilitating. The symptoms may occur gradually or suddenly and may be constant or intermittent. Pain occurrence typically depends on your activity, positions, and movements. If a disc herniation is the cause of your sciatica symptoms, you may notice exacerbated shooting pain when you cough, sneeze, or bearing down. The good news is that with a proper diagnosis and treatment, most of our sciatica patients in Greenville get better quickly at Upstate Spine & Sport with conservative care (without drugs, injections, surgery) in few weeks or months (for severe cases). When a case is outside our scope of care, we quickly refer you the proper specialist – whether that’s a pain management doctor or surgeon to correct the dysfunction. At Upstate Spine & Sport there are no cookie cutter one-size-fits-all scenario treatments for sciatica. Each individual case is different and requires a unique treatment plan. Our Greenville chiropractor, Dr. David Jolson, assesses your condition to determine how we can best provide you rapid results and sustainable recovery. This includes a thorough physical examination of the lumbar spine, hip, and knees, including muscles, joints, posture, and gait, as well as a history of past injuries and lifestyle habits that may be contributing to your condition. Biomechanical, neuromuscular, range of motion and functional tests are conducted to determine why. Other tests such as MRI, X-rays, blood tests or nerve conduction velocity testing may be ordered if necessary. Do not ignore sciatica symptoms. Although relatively uncommon, prolonged compression of the cord levels feeding into the sciatic nerve and the sciatic nerve itself can lead to permanent nerve damage. It is also important to be aware that sciatica symptoms differ from progressive leg weakness and any loss of or changes in bladder or bowel function. If either of these particular symptoms arises, this is an emergency. Call 911 and seek care from your nearest hospital emergency room. Relief from sciatica starts with selecting the right treatment approach for you. After the cause of your sciatica pain is identified, we help you find the solution to your issue.Sciatica treatments focus on relieving the mechanical obstruction, compression, inflammation, and irritation surrounding the nerve segment that is causing the discomfort. At Upstate Spine & Sport, these treatments may include chiropractic care, sports therapy, myofascial release, and acupuncture, either as stand-alone treatments or in combination. We are far from your typical chiropractor in Greenville SC – our approach isn’t to simply put a band aid on the problem. Our goal is to understand your condition so that we can achieve a lasting solution. That’s why we have many tools to get the job done. Why use a hammer if you’re not positive it’s a nail? The last thing you want is to hammer away at a screw! Greenville sciatica sufferers: you don’t need to spend another day waiting for relief from pain! Call Upstate Spine & Sport to schedule a neuromuscular examination for your sciatica symptoms. Dr. Jolson initiates treatment of sciatica symptoms by utilizing the Mckenzie Method (MDT). MDT is a proven system of examination, treatment, and classification of spinal, joint, and other musculoskeletal pain, backed by years of research, evidence, and practice. The System has been shown to be low cost, fast, and effective even for chronic pain. Dr. Jolson is also the only chiropractor in South Carolina certified in Dynamic Neuromuscular Stabilization, which he uses to strengthen the low back. He also uses Active Release Technique and other soft tissue therapies like FAKTR & the TheraGun. There are many different approaches to select from and he will find the right tool to get you back to what you love ASAP.